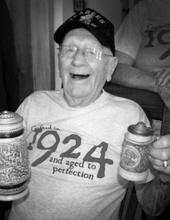 Celebrating the life of Joseph August Koenig Jr.
Obituary for Joseph August Koenig Jr.
Joseph Koenig, age 94, of Knoxville passed away Thursday afternoon, December 6, 2018, at his home. Joseph was born in Cincinnati, Ohio, to Joseph and Anna Lucille Koenig. In addition to his parents, he is preceded in death by his daughter, Karen Marie Koenig, and grandson, Patrick Kazee. He enlisted in the US Navy in June, 1943, and was one of the first US Navy Seabees; he served in World War II in the Pacific Theater until 1946. He was very proud of that service and shared that pride in the Seabee traditions with his grandson, Benjamin, a Seabee currently stationed in Gulfport, MS. Two of his children also served in the military—Barbara in the USAF and Mary Beth in the Navy. Joseph was an alumnus of the University of Cincinnati School of Pharmacy, and followed in his father’s footsteps as a pharmacist. He first worked in his father’s drugstore in Cincinnati, Ohio, and later opened his first drugstore in Cincinnati, Ohio. His wife of nearly 50 years, Sheila, worked for him when she graduated from high school; after working together for 10 years, they married on January 21, 1969. Joe and Sheila loved their life together in Cincinnati, and later moved to Tucson, Arizona, with their son, David, where they lived for over 20 years. Joe officially retired while in Arizona; in 1995, they moved to Knoxville, TN. Joe and Sheila traveled extensively throughout their marriage together, including to Alaska, the Caribbean, Niagara Falls, Italy, England, and Scotland, and traveled throughout the US on Southwest Airlines with their daughter, Nancy, who is a long-time employee of Southwest. Everywhere Joe went, he would inevitably meet someone he knew…even in Rome in St Peter’s square and at the museum of David in Florence, Italy! In fact, Joe never knew a stranger—he loved to meet people and always had a story to tell. He loved golf, playing several times a week up until the age of 91, and was a longtime member of Beaver Brook Golf and Country Club. He even attended the practice session of the 2004 Masters Golf Tournament at Augusta National Golf Club. There is not a room in the house that does not have a piece of golf memorabilia! Beside Sheila, Joe’s greatest love was his family—he was involved with nearly every facet of their lives, spent countless holidays with children and grandchildren, attended the wedding of every child and grandchild, baptisms of grandchildren and great-grandchildren, graduations, concerts, football games, and even marching band competitions. He loved all things military, and reveled in visiting military installations; a special joy of his was visiting the Pima County Air Museum aircraft “graveyard,” where he and his grandson JR spent many hours climbing onto defunct airplanes. He was especially devoted to his disabled son, David, and planned his life around him, ensuring David was well-cared for and enrolled in the best programs available, even to the extent of moving cross-country twice to avail David with the best support. For the last 23 years, Joe and Sheila have been avid supporters and benefactors of Sunshine Industries and Special Olympics, and made a special effort to attend functions and competitions. They have always been tireless advocates for issues affecting mentally disabled adults. He is survived by his beloved wife, Sheila, his brother, Rob, his children and their spouses, David Alan Koenig, Barbara & Alex Ritchey, Nancy Ridder, and Mary Beth Kazee; grandchildren and spouses, Mandy and Brian Stock, Becky and Ben Morrow, Joe and Angie Ridder, Lauren Ridder, Kevin Ridder, Karen Nicole Kazee, and Meghan Kazee; and great-grandchildren, Lydia Stock, Molly Stock, Isabella Stock, Sophie Josephine Morrow, Benjamin Ridder, Jacob Ridder, Andrew Ridder, and Anthony Ridder. The Koenig family would also like to recognize and thank friends and neighbors and fellow parishioners at All Saints Catholic Church, especially Sheila and Joe’s dear friend, Charlene, for her devotion to Dad and Sheila during the times when he needed it most. The staff from Caris Healthcare also were integral in his comfort and well being. Thank you! A Mass will be held at All Saints Catholic Church, 620 North Cedar Bluff Road at 2 p.m. on Tuesday, December 11 with Father Miguel Velez Celebrant followed by full military honors conferred by the U S Navy and the East Tennessee Veteran's Honor Guard. A short reception will follow in the Parish Hall. Click Funeral Home, 9020 Middlebrook Pike, is serving the Koenig family. To send flowers or a remembrance gift to the family of Joseph August Koenig Jr., please visit our Tribute Store. "Email Address" would like to share the life celebration of Joseph August Koenig Jr.. Click on the "link" to go to share a favorite memory or leave a condolence message for the family.